UAV « Global Market Insights, Inc. The growing focus on precision guidance, navigation and control in the aviation industry has led to the growth of the global AHRS market in recent years. A sensor-based device used to determine the orientation of a vehicle or the object it is integrated to, AHRS usage is critical mainly for aircraft that fly during darkness or under conditions of reduced visibility. The product is light weight, small sized and is equipped with self-correcting capability which has led to its prolonged application in business jets, turboprops, and piston-powered aircraft as well as in unmanned aerial vehicles (UAVs), human body motion tracking and more. In any navigation system, the product can continuously make small corrections by using periods of stable flight and reference attitude, thus improving features like autopilot and diminishing prolonged sessions of turbulence. Its commendable characteristics have overtly led to a robust upsurge in the product adoption in recent years, propelling AHRS industry trends. The development of advanced technologies like micro-electromechanical systems (MEMS) is certain to boost the product penetration as well. AHRS is designed to replace traditional mechanical gyroscopic instruments and nowadays come with MEMS gyroscopes, magnetometers and accelerometers. Some AHRS also use GPS receivers to improve long-term gyroscopes stability thus offering OEMs high performance and lightweight portfolios. 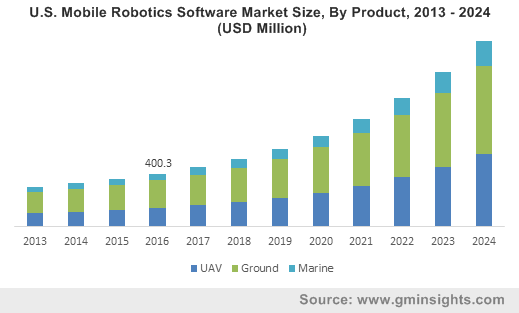 Additionally, the rising demand for such technologies in the UAV sector for commercial and military activities like surveillance, reconnaissance and target attacks has also stimulated the growth of the attitude and heading reference system industry. Of late, military organizations are employing UAVs for mobile missions, especially in spying, monitoring and inspection scenarios. These autonomous vehicles demand precise stability and navigation for determining attitude angles in diverse environments. Although these angles can be measured using a conventional INS (inertial navigation system) system, modern AHRS MEMS technologies are offering low-cost, lightweight solutions to UAV developers, which are more appropriate in reducing embedded systems space and weight. With real-time monitoring and provision for security and surveillance facilities, the AHRS market will certainly receive momentum from the escalating deployment of UAVs in the years ahead. Another platform-based segment that is likely to gain traction in the AHRS industry is GPS. 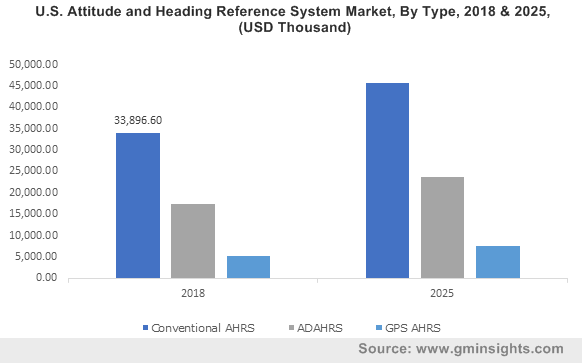 Indeed, GPS-based AHRS market is likely to accrue quite some profit in the years to come, given the product’s superior performance in navigation and positioning operations. Low cost, compact GPS AHRS systems are currently being used to track human body movements in indoor environments by estimation of the 3D orientation. In addition to human tracking capability, GPS-centric systems provide efficient position estimates and compute longitudinal acceleration to help remove drift errors present in conventional AHRS. 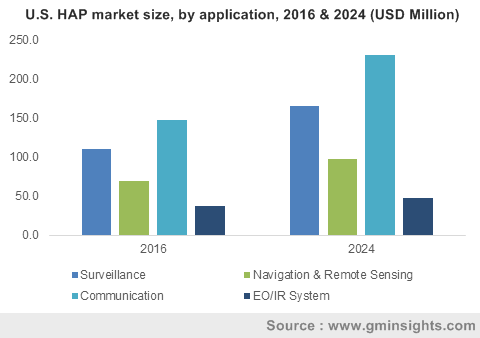 The benefits offered by the systems will enhance their penetration in the years ahead, subsequently impelling GPS-based AHRS market share over 2019-2025. 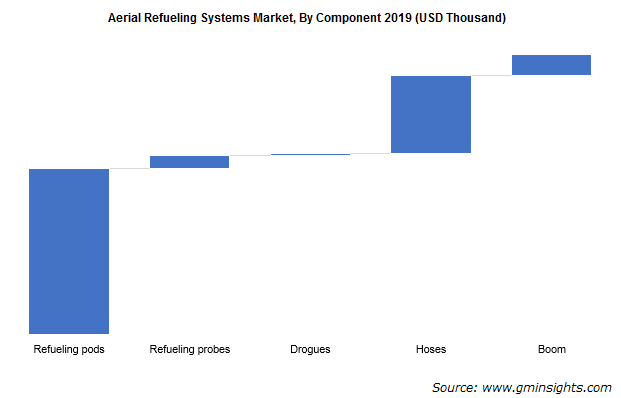 North America is anticipated to emerge as a pivotal revenue pocket for the global AHRS market, primarily on account of the rising demand for military UAVs. Increasing demand for business aircraft and surging air passenger traffic will further enhance the regional industry growth over 2019-2025. According to the U.S. Federal Aviation Administration’s (FAA) forecast report, the U.S. carrier sectors profitability is anticipated to remain steady or increase due to improving economy in the coming years. Furthermore, the industry will command profitability by means of increasing demand for air travel and airfares due to rising disposable income. The presence of pivotal aircraft OEMs such as Lockheed Martin, Boeing and Northrop Grumman that have been focusing on the launch of advanced systems will also further propel the North America attitude and heading reference system market share. The attitude and heading reference system, a sensor-based device that provides attitude information for aircraft, is cautiously designed to replace traditional mechanical gyroscope attitude systems and can effectively offer applications with enhanced correction capabilities. Technological advancements for improving accuracy and efficiency coupled with enhanced performance standards are likely to impel the industry trends in the years ahead. As per Global Market Insights, Inc., AHRS market size will surpass $455 million by 2025. This entry was posted in Aerospace and Defense and tagged Accelerometers, ADAHRS, AHRS Market, Attitude and Heading Reference System Market, Conventional AHRS, Digital Processing Unit, Fixed Wing, GPS AHRS, Gyroscopes, Magnetometer, Rotary Wing, UAV. As automation pervades lucrative verticals, the agriculture domain, not to be obliterated, has also joined the list. 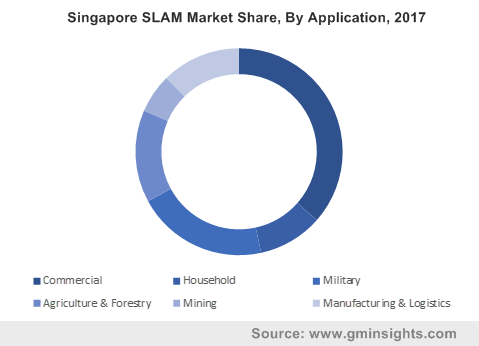 Autonomous farm equipment market, in this regard, may be considered as one of the many pivotal sub-spheres of the tech-based agriculture sector, that has been gaining mass momentum in recent times. With the influx of highly advanced tech discoveries and the shifting trends toward the deployment of robotics owing to labor shortage, the utilization of self-operating agro-based components is on a rise, thereby impelling autonomous farm equipment market share. One of the most noteworthy trends of autonomous farm equipment industry in recent times is the rapid entry of start-ups in this business vertical, posing quite an interesting competitive scenario for prominent players. With the profound growth in the arena of robotics, entrants in autonomous farm equipment market have been attempting to actively tap every lucrative opportunity to come up with unique product ranges. For instance, a robotic engineer from Harper Adams University, England recently came up with an idea that it may be possible to produce crops without having to actually climb onto a tractor. In this case, through high-end technology, a SimTech drill had been attached to the tractor, that undertook the seeding operations, while an automated Sampo Rosenlew 130 harvested the crop. In the years to come, it has been forecast that farmers may cease performing actual farming tasks, delegating them to automated devices, while they keep themselves free for other tasks. In the event that automated tractors such as the aforementioned prove successful in tests conducted on 100-hectare fields, the concept is likely to brew a revolution in autonomous farm equipment market. Having documented a long-standing history of being an agro-based economy, India is touted to emerge as one of the pivotal regional autonomous farm equipment markets. Even as on 2017, more than 50% of the of the Indian populace is inherently dependent on agriculture and related activities for sustenance. However, more than 80% of Indian farmers own farmland lesser than two hectares, and have a rather small, bifurcated sense of ownership in India’s huge agriculture sector. Amidst this massive fragmentation, it goes without saying that the country’s farming activities stay put, owing to the lack of high yielding fertilizers and seeds and the inadequacy of modern production and processing methodologies. This in consequence, has led to India evolving as a rather lucrative ground for the development of autonomous farm equipment market. India is thus undergoing a paradigm shift, what has been dubbed as ‘Farming 3.0’ – the third farming revolution. In accordance, the nation seems to be actively drifting toward innovative farming, which would prove to be rather advantageous for the growth of autonomous farm equipment industry in India. The nation has been, since the last few years, welcoming investors and start-ups to establish their base in India and diligently pursue advanced technology to come up with a range of highly innovative products such as partially and fully automated tractors and harvesters. Another popular technology that is being harnessed of late is that of UAVs (unmanned aerial vehicles) or drones. Owing to their superlative benefits ranging from undertaking geological surveys for evaluating fields and reducing response time to improve crop health and water efficiency in the fields, these beauties are being deployed in agriculture on a larger scale than anticipated, which has provided quite a profitable boost to the overall autonomous farm equipment market. This is quite evident from the robust growth of the agricultural drones industry as well – the business size reportedly stood at USD 300 million in 2016. UAVs are also being utilized in India, though the concept is yet to gain mass prominence. 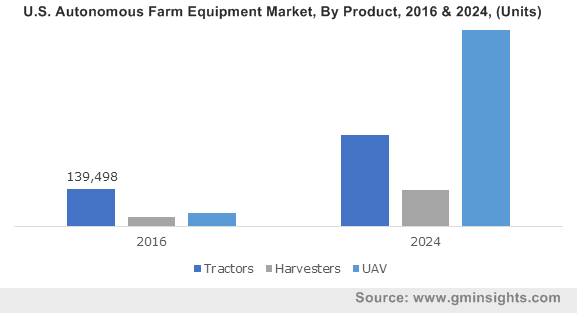 However, analysts seem to be positive regarding the popularity of agricultural drones in the nation, the massive deployment of which would eventually stimulate India autonomous farm equipment market share. With automated devices garnering momentum in India, it has also been projected that the region would be a major revenue contributor toward APAC autonomous farm equipment industry. Given that the continent in itself is a hub of major agro-based emerging economies, it remains quite unarguable that Asia Pacific would be one of the key regional autonomous farm equipment markets in the years to come. 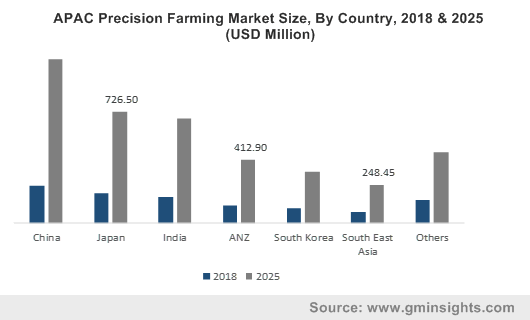 Led by India, Japan, China, Australia, and South Korea, APAC autonomous farm equipment industry share has been projected to register a CAGR of 25% over 2017-2024. While the notion of self-operating equipment seems quite attractive in theory, there remains no shred of doubt that practically implementing the concept on a large scale is enormously expensive. Product development and implementation costs thus, in particular, are likely to emerge as key restraints for autonomous equipment market in the future. In consequence, companies have been attempting to devise newer strategies to brainstorm cost-effective solutions in order to increase product penetration, which would eventually have an impact on the revenue graph of autonomous farm equipment industry. The successful application of GPS systems in agriculture and the deployment of IoT in the farming sector notwithstanding, autonomous farm equipment market trends are expected to escalate in the forthcoming years. As per estimates, autonomous farm equipment industry size is expected to exceed 3 million units by 2024, in terms of volume. This entry was posted in Automotive & Transportation and tagged Autonomous Farm Equipment Market, Autonomous Farm Equipment Market Forecast, Autonomous Farm Equipment Market Research, Autonomous Farm Equipment Market Share, Autonomous Farm Equipment Market Size, Autonomous Farm Equipment Market Trends, Fully Autonomous, Harvesters, Partially Autonomous, Tractors, UAV. This entry was posted in Automotive & Transportation and tagged Aerial, Ground, Marine, Mobile Robot Software Market, Mobile Robotics Software Market, Mobile Robotics Software Market Growth, Mobile Robotics Software Market Size, Mobile Robotics Software Market Study, Mobile Robotics Software Market Trends, Mobile Robotics Software Market Value, UAV.